The Iowa City Ambulatory Surgical Center is a multi-specialty, state of the art surgical facility providing quality outpatient surgical services. The center established in 2008 currently performs approximately 7,000 surgical procedures per year. 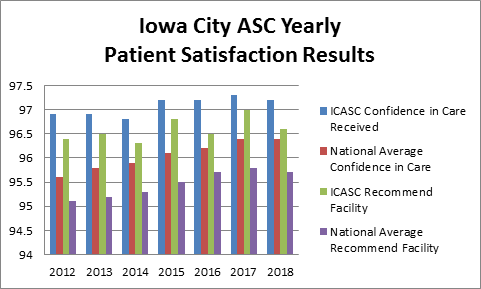 Most patients who do not require specialized hospital treatment or overnight observation can safely have their outpatient surgical procedure completed at the Iowa City ASC. Our goal is to deliver exceptional care in a uniquely tailored experience, providing restoration to your body and your life. LEARN MORE About our Quality Patient Care. We have a proven history of offering new, innovative procedures in an outpatient environment. We are leaders in performing outpatient spine and balloon sinuloplasty procedures. We were the first in the area to offer ORA with VerifEye+ technology for our cataract patients. We are also the first center in Iowa to offer Inspire therapy. Inspire therapy is a new, clinically proven treatment option, approved by the FDA, for people with Obstructive Sleeve Apnea (OSA). 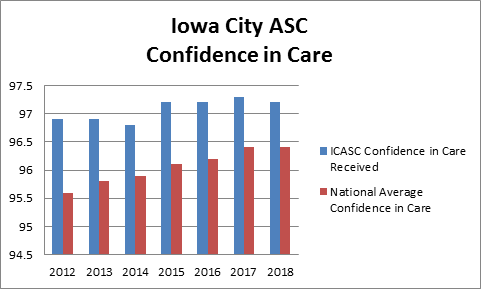 Iowa City ASC makes it a priority to have the latest equipment and instruments so that your procedure is completed in a manner appropriate for you. We provide the most cost-effective outpatient surgical option available in the area. Please review with your surgeon if your procedure can be done at the Iowa City ASC. We provide both payment plans, cash discounts and care credit options. We are willing to work with you in order to assure that your procedure is paid for in a manner appropriate to your situation. Please feel free to contact the center or review our website for input related to financial savings and procedure costs, we will try and help you understand the cost of your procedure before you receive a bill. 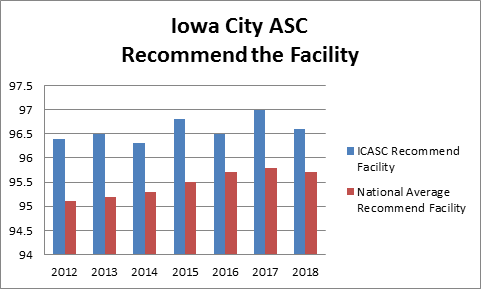 The Iowa City ASC is open Monday through Friday, 5:30 a.m. to 5 p.m. If your care requires that we stay open later, that’s what we do in order for you to receive the timeliest clinical treatment. With five fully equipped operating rooms, we provide flexible scheduling options. We work closely with the physician offices in order to get you the best time for your schedule. Our convenient location is just off I-80 on Northgate Drive. Free parking is available right outside our front door.